The best kind of axe you can wish for is an axe that has not one, not two, but several different uses. The Small Spike Axe exemplifies this idea, and is a multi-purpose axe that is useful in a wide variety of tasks when hiking, camping, or surviving. This axe features an almost A-shaped head that features a curved, chopping bit at one end and a penetrative spike on the other. The bit allows for great cutting and chopping, whether working with meat, wood, or anything else, while the spike is fantastic for making holes or hooking materials. The head of the axe is made from cast 440C stainless steel using a special method that ensures both incredibly detailed work as well as impressively strong steel. The axe also features an attractive classic finish that gives the axe an authentic, hand-forged look that is quite eye-catching. 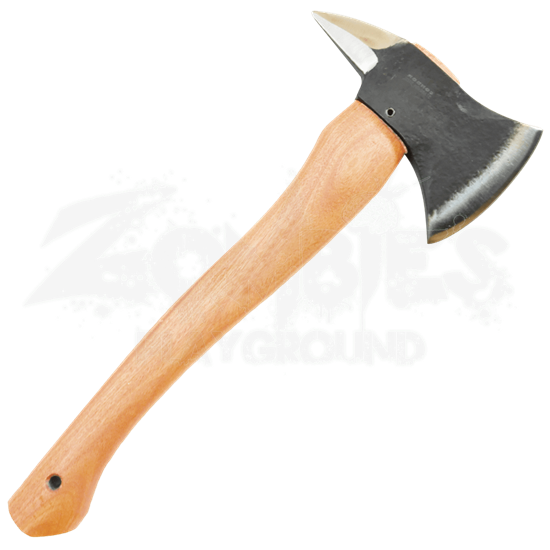 The handle is made from authentic American hickory, which has been specially selected in order to ensure proper grain orientation, which gives the axes haft a measure of strength and durability, as well as a level of comfort when held and used. Included with the axe is an adjustable leather sheath, which features a swiveling belt loop. The axe head measures 5.125 inches long and features a 3 inch long cutting edge, while the overall length of the axe is 12 inches. If you are headed into the woods to hike or camp but do not know what exactly you might be facing, then make sure you bring along a tool that can handle and do it all, like the rugged and reliable Small Spike Axe.